Get an edge in your math, engineering & science classes! Maple is powerful, easy to use math software that can improve your grades, save you time and money, and increase your confidence. In fact, Maple may very well be the most powerful piece of software you will ever use. Maple is used in robotics, aerospace, medical research, green energy projects, consumer electronics, and a whole lot more. Today, Maple will help you succeed in your courses. Tomorrow? Who knows! See how easy it is to get started with Maple! From double-checking assignments to deepening your conceptual understanding, here are some of the ways Maple helps you get better grades. Stop losing marks because of small mechanical errors in your assignments. With Maple, you can check your answers before you hand in your assignment, and fix those little problems before they can affect your grade. You can use Maple to double check your answers when you multiply matrices, expand or factor polynomials, find derivatives, limits, and integrals, and more! Find out you’ve misunderstood something before the test, not because of the test. After you’ve solved a problem yourself, you can solve it again in Maple and compare answers. If the answers never match, it’s time to take a closer look at your method. Deepen your understanding by visualizing those hard-to-picture ideas. Maple includes built-in visualization tools designed specifically to help students master important concepts, plus you can easy create 2-D and 3-D plots, animations, and interactive plots, to help you better understand your own problems and solutions. Aren't always sure if you're on the right track? With Maple, you can check your solutions as you work through practice problems and develop your intuition through visualizations and "what if" explorations, so you can be confident in your understanding. Determine what you know and what you don’t by using Maple to check the answers to your assignment and practice problems, even when the answer isn’t in the back of the book. Discover where you went wrong if your answer is incorrect. Understanding why your answer is incorrect will help you improve, and give you an indication of what you need to work on, as well as what you don’t. Don’t let your confidence be shaken inappropriately, by thinking you don’t understand the solution method, when the problem was that you multiplied 2 and 3 and got 5, or that the answer in the back of the book was wrong. Plot as many examples as you need to develop your intuition about how different types of functions behave, and how they are affected by their parameters. Explore interactive visualizations until you "get it", with hundreds of examples including inverse functions, vector projections, Riemann Sums, complex arithmetic, and solids of revolution. Here are some of the ways Maple can save you time, and make the time you invest in your courses more productive. Find the source of your mistakes quickly. Use Maple to check yours steps, so you can identify the source of the mistake in your derivation quickly, and avoid repeating time-consuming calculations that are actually correct. Grasp concepts faster. Maple has large number of interactive tools designed specially to help students visualize and explore mathematical concepts more effectively than you can learn from a static textbook or blackboard. Get answers instantly. Sometimes you need the answer to a problem, and neither you nor your instructors care how you get it. Maple gives you answers to even complex problems instantly. Save your eraser. With Maple, you can try out different approaches to your problem easily, so you can make sure your will approach works before you pick up your pencil. 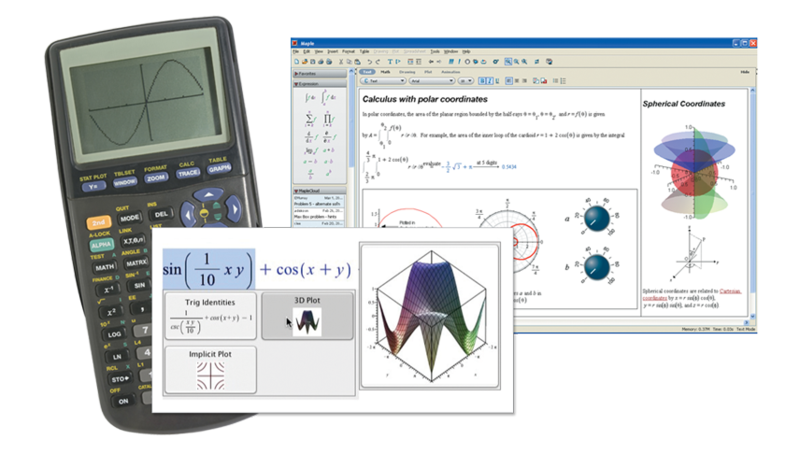 Maple is cheaper than many graphing calculators, is easier to use, and does more. What's not to like? And with Maple's Clickable Math approach, it's easy! Watch this 4 minute video to see how quickly you can make Maple work for you. Fill out the form below to receive your poster*. You can also download this poster.